It was champagne dance once again in former Abia state governor Dr.Orji Uzor Kalu's Lagos home as sports lovers drowned his Lagos home with songs, hailing Enyimba's third Federation Cup triumph. An elated Kalu screamed,"You can't beat Enyimba in a grand-finale penalty shoot -out.I know the team so well.You saw their goals-super shots , the more you watch,the less you see.Aba made." 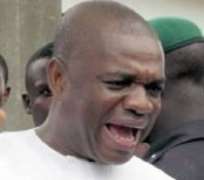 The ex-governor was set to catch a flight back to Abuja for an important appointment when a group of Enyimba fans thronged his home last Sunday just a few minutes to kick-off,pleading to watch the game in his house.Kalu had to cancel his flight.And as the match progressed,one could not fault his analysis. "Enyimba are Cup final penalty specialists",he said. "In 2004,they defeated Etoile of Tunisia 5-4 penalties to retain the CAF Champions League.Earlier in the year,the team had beaten Lobi 5-3penalties to win the Charity Cup.Lobi lost again 6-5 penalties in the 2005 Federation Cup." According to Kalu,"the rare occassion when Enyimba lost the Cup through penalties was in 2010 to Kaduna United.You know what,the winners were managed by a former Enyimba coach Maurice Cooreman.Enyimba later avenged that loss by hitting the Kaduna team 4-2 in that year's Charity Cup.Enyimba also beat Kano Pillars 4-3 penalties to win the Presidential Inauguration Cup in 2011." Kalu picked on Stephen Saviour,scorer of Enyimba's last kick against Warri Wolves. "He lived up to his name with Enyimba.Good for the young man.In 2005,his name failed Lobi against Enyimba in the Confederations Cup final.Saviour scored for Lobi during over-time,it took the next minute for Atanda Shakibu to level up for the Aba team.Saviour scored again during shoot-out.But Duke Udi's miss gave the Cup to Enyimba,"Kalu revealed.